Shin Kamiya is a young Japanese teenager, who made his debut in Tekken: Blood Vengeance. 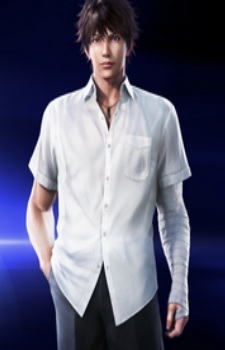 Shin was an old friend of Jin Kazama, who went to Mishima Polytechnic School with him. In Blood Vengeance, both the Mishima Zaibatsu and G Corporation are looking for information about him in order to track down Shin himself. So Alisa Bosconovitch (under the orders of Nina Williams) and Ling Xiaoyu (under the orders of Anna Williams) are sent to spy on him at his school in Kyoto. During their investigation, Alisa and Xiaoyu team up with each other and work together, and Xiaoyu herself turns against Anna. At that moment, Shin is kidnapped by an unknown assailant. Later on, the two girls learn more about Shin's background and soon discover that genetic experiments were being done on Shin and his classmates (who were presumably other friends of Jin), and now realize that the Mishimas were seeking Shin, who is in fact the sole survivor of his classmates and M Cell subject, for immortality. Later at an ancient Kyoto castle, Xiaoyu, Alisa, Jin and Kazuya Mishima learn that this was in fact an elaborate plan engineered and planned by Heihachi Mishima. Shin then furiously confronts Heihachi for what he's done and attempts to fight him, but Heihachi grabs him and attempts to kill him. Jin then told Heihachi to release him, stating that Shin had nothing to do with their rivalry, but it was too late. In his last moments alive, Shin mumbled to Jin, Alisa, and Xiaoyu his last words, "Jin... it's up to you now..." and died in Alisa's arms. Furious, Jin fought and defeated Kazuya and Heihachi, thus avenging his friend's death. At the beginning of the three-way brawl between Jin, Kazuya and Heihachi, Shin's body isn't seen when Xiaoyu and Alisa leave the castle. It may have been blown away when the three family members created a shockwave when they hit their fists altogether.